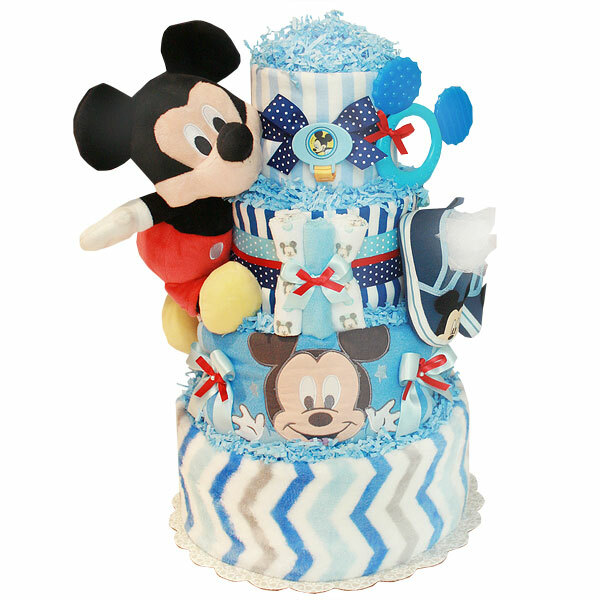 Four tiers Cute Mickey Mouse Diaper Cake is a great baby shower gift and a gorgeous centerpiece for a Mickey Mouse themed baby shower. Can also be used to welcome a new baby in the hospital room. This diaper cake is made of 70-80 Pampers Swaddlers diapers size 1 (7-14 lbs. ); One super soft blanket; Two flannel receiving blankets 100% Cotton; One Muslin Swaddle Blanket; One Mickey Mouse pacifier; One Mickey Mouse pacifier's holder; One soft Mickey Mouse plush toy; One pair of Mickey Mouse shoes; Two bodysuits; One Dr.Brown Baby bottle; One Mickey Mouse teether; One Mickey Mouse bib; Three washcloths; lots of ribbons and bows. The diapers are held together by elegant ribbons (no glue on diapers). Ribbons are hand-stitched with white embroidery floss on the back of the cake, allowing for a clean, handmade look. Decorated using pins, ribbons, bows, embellishments and blue crinkle paper.